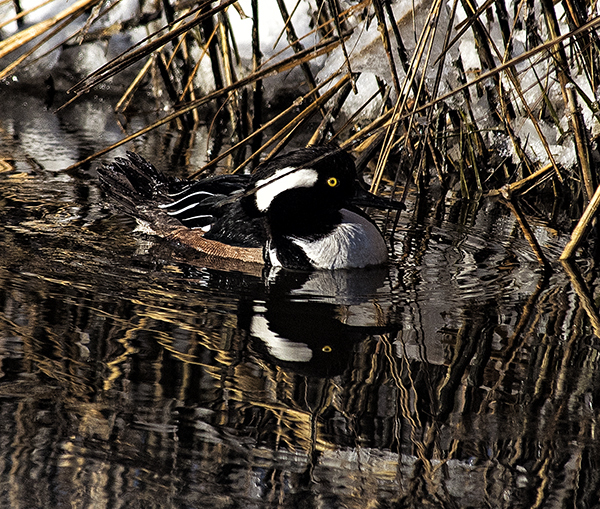 Shortly after sunrise this morning, with the air temperature at 5 degrees and a little wind blowing, this Hooded Merganser snugged up against a snowy river bank out of the wind and let the warming sunrays work their magic. Its coloring blends in very well with the reeds, snow and dark reflections on the water. 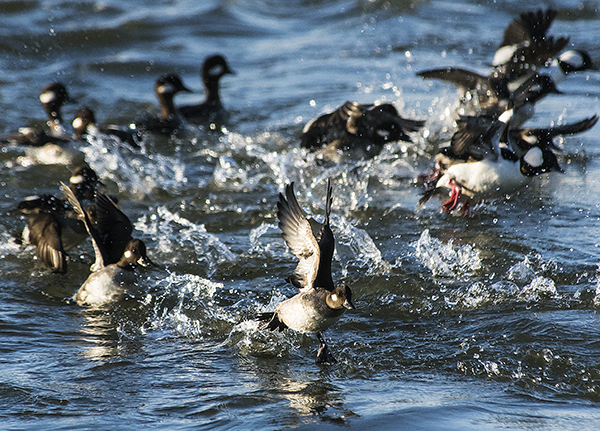 The word goes out and these Buffleheads all take to flight in a split second. I wonder how they know when to take of or who makes the call? Maybe it is that hen running ahead of the pack who makes the order. 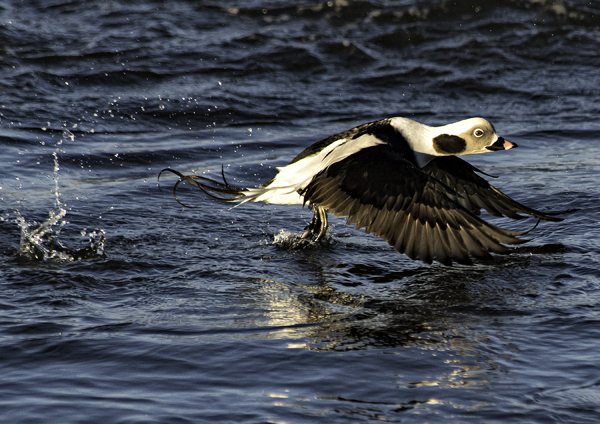 Yesterday I posted a drake Long-tailed duck taking off with his wings up, so today you get the photograph of the wings down. An interesting note was passed along to me by a birding friend. I used the term ‘breeding’ in describing the winter, non-breeding, plumage of the Long-tailed. I got that information from the Cornell Lab of Ornithology website ( a great place for bird info) which say about the Long-tailed, “Unlike other waterfowl, the Long-tailed Duck wears its “breeding” or Alternate Plumage only in the winter. It gets its “nonbreeding” or Basic Plumage in the spring and wears it for the breeding season. Most other ducks wear the nonbreeding plumage only for a short period in the late summer.” It is an interesting and beautiful duck and can be seen in Delaware very commonly in Indian River Inlet in the winter. 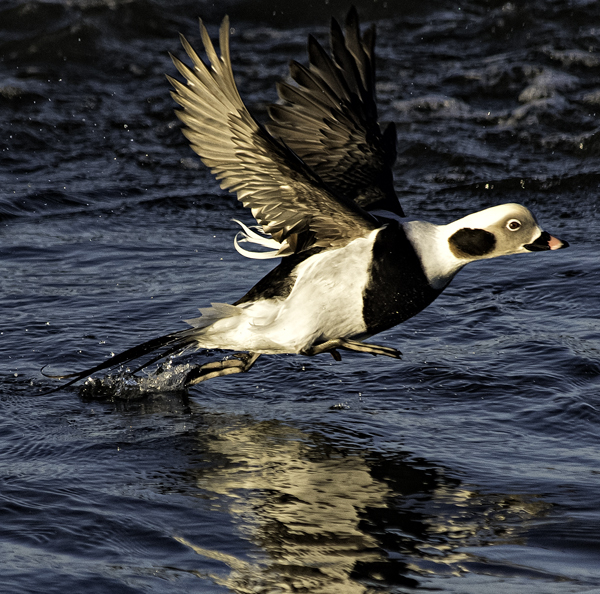 The long tail feathers are better seen as he hops out of the water in this photograph. I found a good number of Long-tailed ducks feeding in Indian River Inlet this afternoon. These guys breed in the Arctic in the summer but wears their ‘breeding’ plumage in the winter, luckily for us. They are beautiful ducks that can dive as deeply as 200 feet, and stay under water for a long time. In the inlet they were feeding along the jetty rocks and seemingly enjoying the sunny, breezy, cold afternoon. This drake took off right in front of me after a short run on the water and I am very thankful that he did. His long tail feathers make it obvious how it got its name. These mallards rested on an icy ledge this weekend. 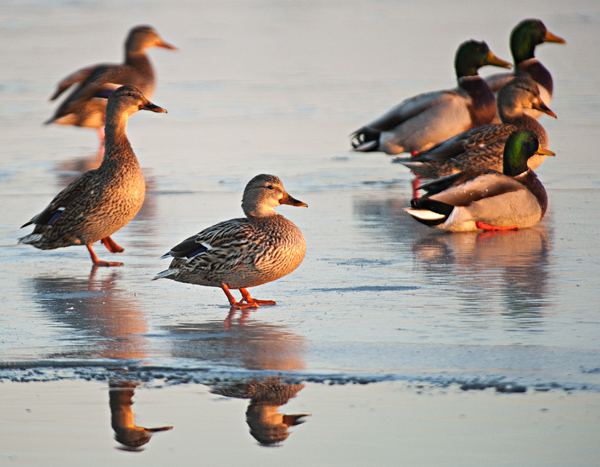 They were lucky to find some open water as temperatures in the teens froze most water bodies. First light of the rising sun brought a little warmth to their feathers. 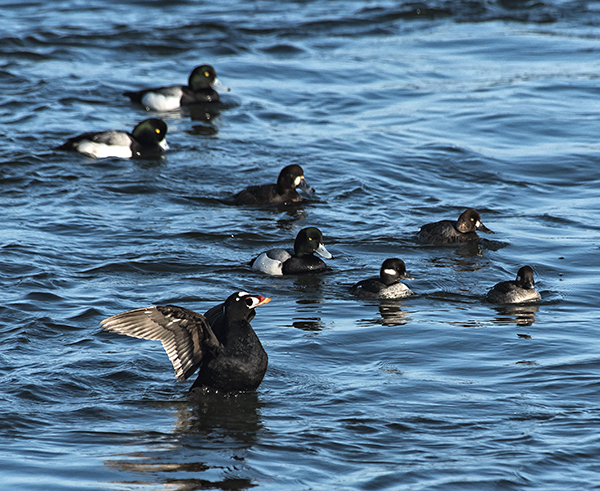 A group of scoter’s is probably not a school, but when I saw hundreds of them in large groups recently, it was a lesson to me. I had never seen these beautiful birds up close before. This group was very picturesque as they skimmed (scooted? )across ocean water in the late day sun. The sun came out today and the temperature was in the mid 40’s. It seemed almost spring like. 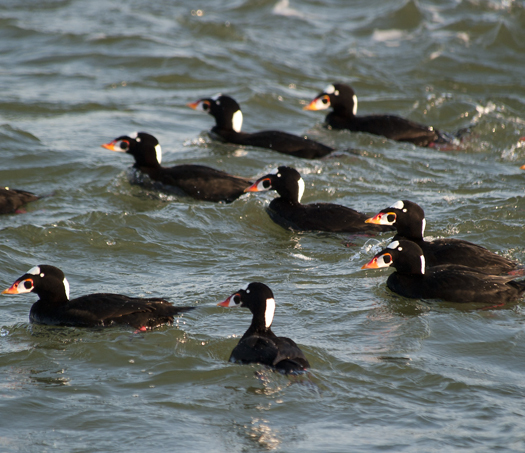 I went out looking for sea ducks and found some Surf Scoters in nice afternoon light. 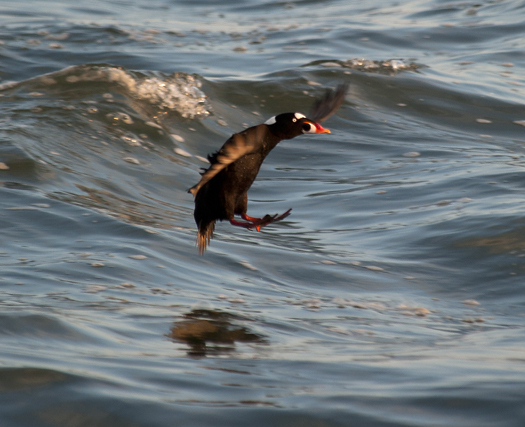 This drake was putting on the brakes for a water landing. A nice stack of Northern Pintails. Grooming is an important part of a bird’s day. 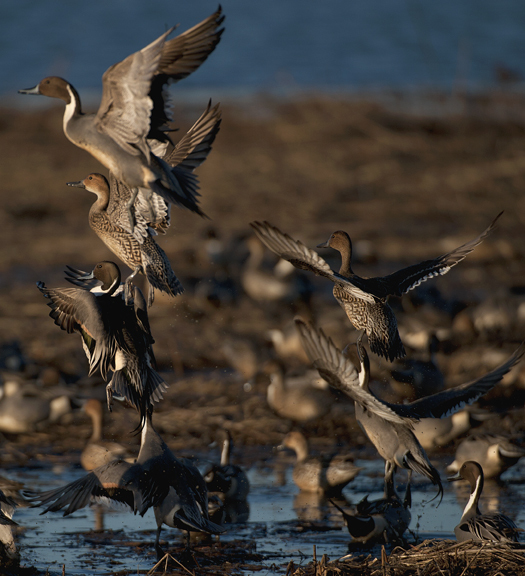 This hen and drake Northern Pintail know it pays to look your best.